The best advice I ever got before coming to college was this: for the first couple of months, you probably are not going to love it, in fact you might hate it. After committing early decision to Dartmouth, it was exactly what I needed to hear. I truly had not thought I was going to get in here, and as soon as I did I felt trapped. It seemed that my future was predestined and that there was nothing I could do about it. I did not love my first year at Dartmouth. I thought I did, I told others I did, I told myself I did. But I did not. I was constantly comparing myself to others, and consistently not measuring up. Despite being surrounded by people I considered friends, I felt downright lonely. Sometimes it was because I was with the wrong people, but usually it was because I was not the person I wanted to be. I thought I had missed opportunities, missed chances to make friends, missed my shot at having that “perfect” college experience. In those moments of intense self-doubt I would remember those words of advice and remind myself that I was not alone, and that maybe things could get better. That summer I joined Dartmouth Outing Club trail crew on a whim, and it was the best decision I ever made. I spent that summer having hour long discussions about Hillary Duff’s Christmas album while staining a cabin, went to open mic night at a bar as my crew members performed “Get Low” by Lil Jon a cappella and hiked massive mountains at sunset just to spell out “BUTTS” with our bodies at the top. That summer reminded me how to laugh. It reminded me of the person I wanted to be: someone kind, excited and down for anything. Someone that shaped their own future. That summer showed me that Dartmouth is more than one path that you are locked into. Don’t curate your life, you’re not a brand. Learn what goes into compost, recycling and landfill. Send more flitzes. Allow yourself to be vulnerable with others, and encourage them to do the same. If you make a mess in Collis, clean it up yourself. Get to know a Safety and Security officer or two (preferably without being Good Sammed or breaking your foot). Take responsibility for your actions. Pursue the friendships that matter. Don’t be friends with people you dread interacting with. Cry on the phone to your parents, but be sure to tell them that just having them listen to your tears is helping. Go to therapy when you need it. If you have a compliment, give it. Pee on top of mountains. Get some killer ice breakers. Jump off of cliffs because your friend did it. Play too much pong. Live with six women. Learn to live with six women. Start calling yourself a woman. Never write someone off. Never stop working out, it’s so much harder to start again than to just continue. Learn where Mink Brook is, then run Mink Brook. Lie on the Green for hours at a time. Go to the Lodge as much as you can. Know that just because you didn’t get into that improv group doesn’t mean you’re not funny. Make others laugh, it’s the best high in the world. Make yourself laugh, it’s the most important thing in the world. The Foco cookies are hotter than you would expect. If you want less, tear sooner. Always check to see if Window #2 is open. Make bucket lists, but don’t be upset when they aren’t completed. Quit being so hard on yourself. 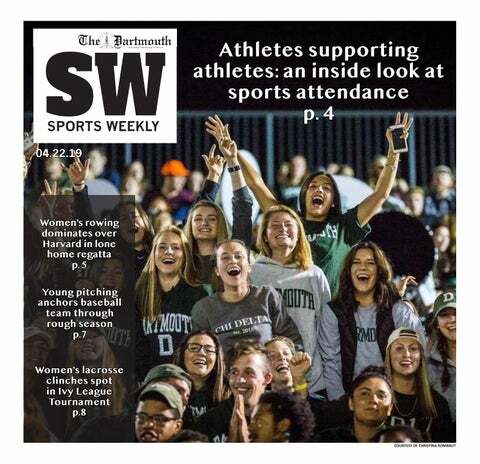 When it comes down to it, Dartmouth is the people. I have learned that not everyone is a good person. Everyone doesn’t deserve your love nor your time. That is okay. I have learned that most people are good, but just because someone is good does not mean you need to, nor should you, be friends. That is okay. Mostly I have learned that we are all trying our hardest, and people make mistakes. Sometimes they deserve your forgiveness, sometimes they don’t. I am trying to be less judgmental, because at any point we are all three choices away from becoming someone we hate. Be gentle with each other, but be careful with your choices. Four years later I know the answer: because it’s worth it. The feeling I have about graduating, that “I have no more tears but oh wow I think I might vomit” feeling, that is worth it. This unknown future that seemed impossible, it has been better than I could have ever imagined. It has given me a profession that I’m actually passionate about, professors that have caused me to question my world view, a belly filled with Keystone after a successful night of pong, long lingering dinners with housemates that I never want to end and boxes of memories. Memories that make me cry and memories that make me cry of happiness. Sometimes I stand in the center of the Green and let them all come flooding back. This future has been pretty damn good. So yes, the future seems impossible, but I have hope we’ll be just fine. Grace Miller ’17 is a former Dartbeat editor.